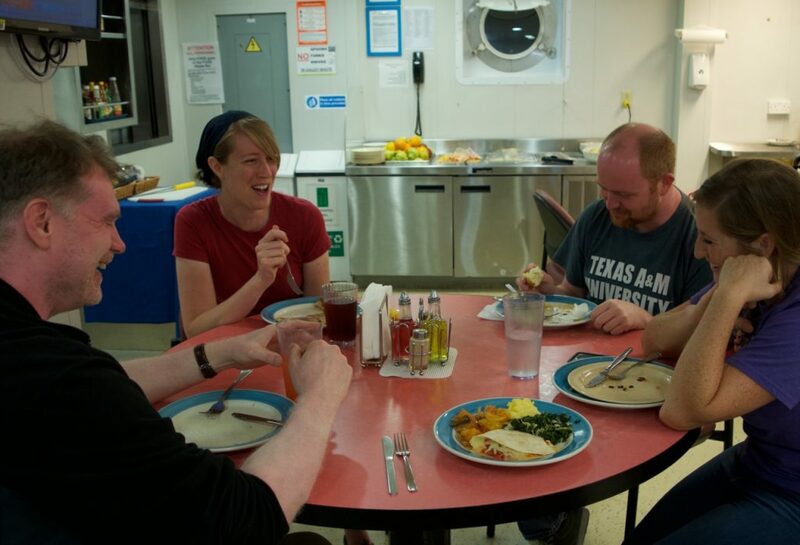 You can argue about this–perhaps the Core Lab, the Chem Lab, the Gym, one’s own cabin–but I think the best room on board is the Mess Hall or Galley. The place we enjoy all our meals and cookie breaks together. I’m sorry I’ve been a bit quiet on the science. We’re drilling a new hole, and putting a metal casing inside that hole so that we can drill down and collect core from even deeper (800-1400 mbsf). Agnes will update you on that process soon! 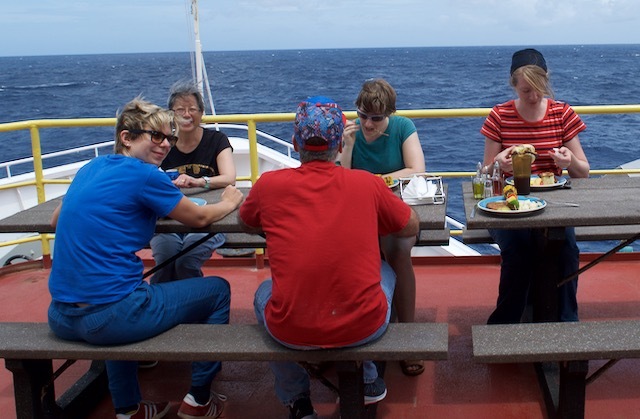 The scientists have been awaiting new core and catching up on writing reports and finishing sampling. In the meantime, I’ve been learning a lot about drilling operations, subduction zones, and some background info for future posts! I’ve also been getting to know the scientists and crew a bit better. They’re a great bunch! So it’s especially delightful to share wonderful meals and snacks with them. The Camp Boss, Paul, must be a magician, with a very able team of 4 cooks and a baker. The array of food present at every meal–keep in mind there are four in 24 hours, and any one might be any meal of the day for someone–is astounding. Small fridges on the countertops are always (so far) stocked with juice, yogurt, and spectacular desserts. The salad bar still has fresh vegetables and excellent home-made hummus. The fruits remain piled high (see teaser photo background! ), next to a counter with ever-present pastries. The hot food line is a buffet of stewed and well-spiced veggies, meats, and soup. You can get eggs to order at any meal. It’s good there’s a gym, heavy lifting of core sections, and lots of running up and down stairs between decks to make us hungry enough to eat all the bounty! Saturday is barbecue day, weather permitting. Special desserts (in addition to the usual excellence) appear on weekends as well! We don’t get any days off for the two months we’re on board, so a little special treat on certain days marks the time and gives us a sense of a break. On top of all that, I appear at the hot food line and declare I’m vegetarian (nicely, of course…). They cook up separate food for the vegetarians (we’re 6 among the 35 scientists+educators), and serve it to us in delightful arrangement. You can see my colorful plate in the photo above. They know us all by name, and call out our dishes when they’re ready! Here’s a photo from our first Saturday barbecue. Last week was a bit rainy, so we stayed inside. It’s been about 30ºC/68ºF every day, but the wind and humidity and rain can change how that feels. Hold on to your hat and your lettuce while you look at the photo!